The boys picked up bubble stuff at Wal-Mart. I was planning to make homemade bubbles, but I knew I would be cutting it too close getting back from the hospital. Wal-Mart now has some long tubes filled with bubble solution and a long slim wand to make super bubbles. I hadn't seen those. I used to have a big round bubble maker with a flat tray. That got tipped over pretty easily. The tubes are a good design and worked out great. The little ones especially liked the flyswatters as you can see in the photo above. They make tons of mini bubbles. One note on that - you've got to swing the flyswatters really fast to get good bubbles. 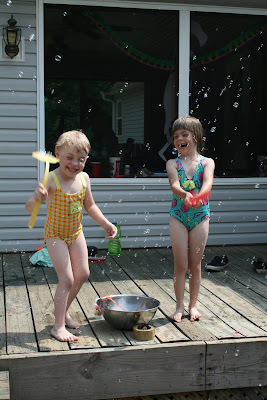 The girls caught right on and had no trouble making mega mini bubbles. If you want to make your own bubbles which is fun too, here's a great recipe for bubbles. I like this one, because I always have the items on hand to mix up bubble stuff. 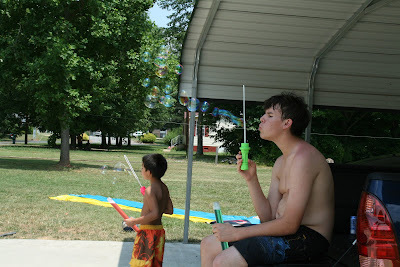 For more information on making bubbles as well as a large batch recipe, see my bubble making article at Yes You Can Grill. 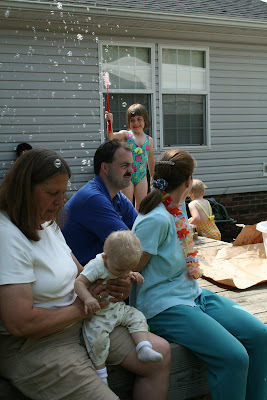 The bubbles, wading pool, Slip and Slide, and water guns kept the kids busy and having fun while I grilled. None of the party props cost very much, and they definately made it a better outdoor party. Karo syrup for bubbles? I will have to try this out with my grandsons, but instead of one cup of water, we'll need gallons and bottles of syrup and dish soap! Thanks. (-: They are a little sticky but not too bad. If the kids drink a little, then it's not a problem. I have a big batch recipe for bubbles at Yes You Can Grill. We use it by the gallons too!